Don’t believe in giants? Think again. Hulking just stage left of Applecrest’s festival bandstand is an honest-to-goodness real life giant. His name is “Big Dill”, he’s orange and he is HUGE! How huge? Well, that’s what we want YOU to tell us for a chance to win the biggest pumpkin you can carry away! Nurtured from a tiny seed right here on the farm, Dill is an Atlantic Giant Pumpkin. 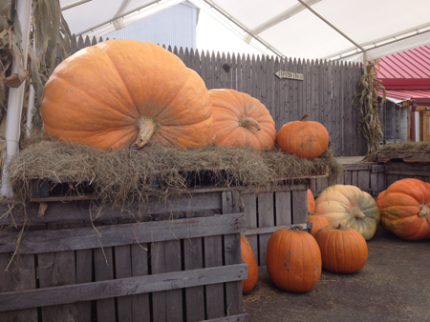 Bred in Nova Scotia for its gargantuan size, this variety of Cucurbita maxima has been known to surpass 1,000 pounds. Big Dill’s viewing hours are 10:00am to 3:00pm, every Saturday and Sunday through the end of October. After marveling at his magnitude, sidle on over to the pumpkin display in the main festival area and hazard a guess at his weight. The winner is announced at 4:00pm. Sunday, September 29th’s winner was young James Hoag. Victorious on Saturday October 5th, a Mr. Cash Svetly. Congratulations on your spot-on guesses, gentlemen, and enjoy your free jack-o-lanterns! It weighs about 1750 lbs.